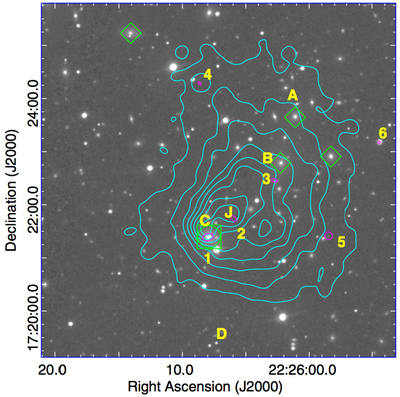 Abell 2443 was part of Miller et al. 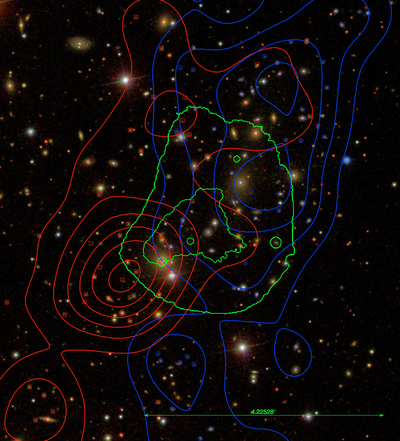 's (2002) MX Northern Abell Cluster Survey II, where they obtained 12 spectroscopic redshifts of cluster members and estimate a velocity dispersion of 975 km/s. Wen et al. 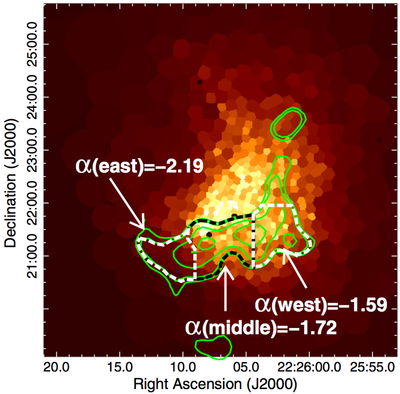 (2007) conducted a 14 medium band optical imaging survey of the A2443 where they reached a limiting magnitude of i~20 (note that the seeing was 5.2"). From photometric redshifts they identified 301 galaxies at the cluster redshift. 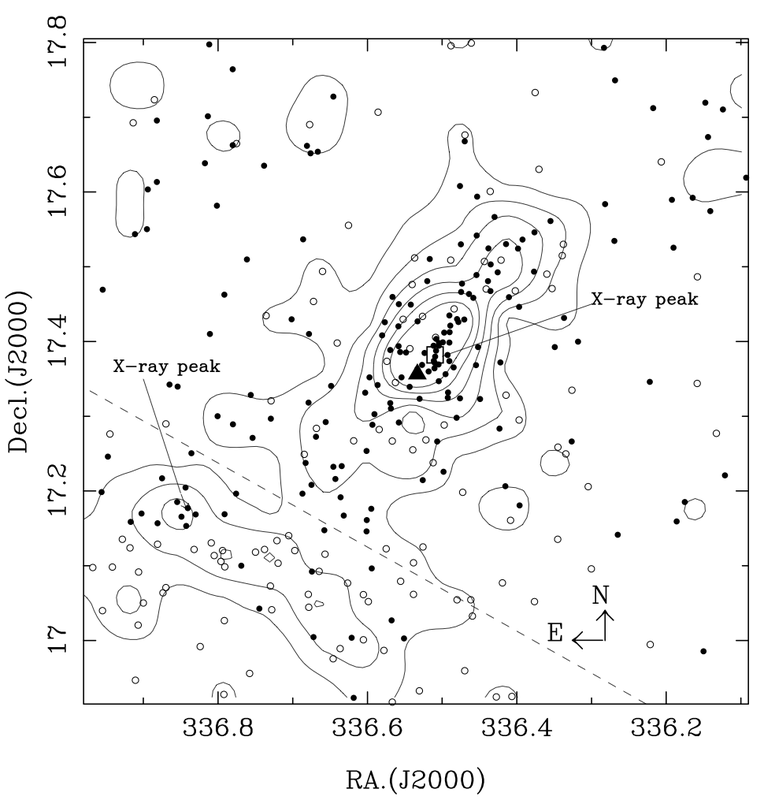 In the same field they observed ZwCL 2224.2+1651 (z~0.1) located 15.7' (~2.5 Mpc) to the southeast of A2443, but note that there is insufficient evidence to determine whether the two cluster are interacting. A2443 appears to be highly elongated in the direction of ZwCL 2224.2+1651. Wen et al. 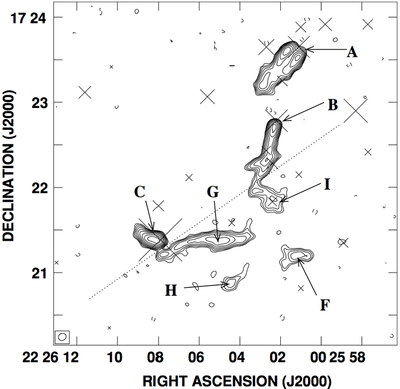 (2007) do observe that the blue fraction of galaxies is much larger in ZwCL 2224.2+1651 compared to A2443. Cohen & Clarke (2011) observed A2443 in the radio from VLA at 1425, 325, and 74MHz and find a number of diffuse radio sources. 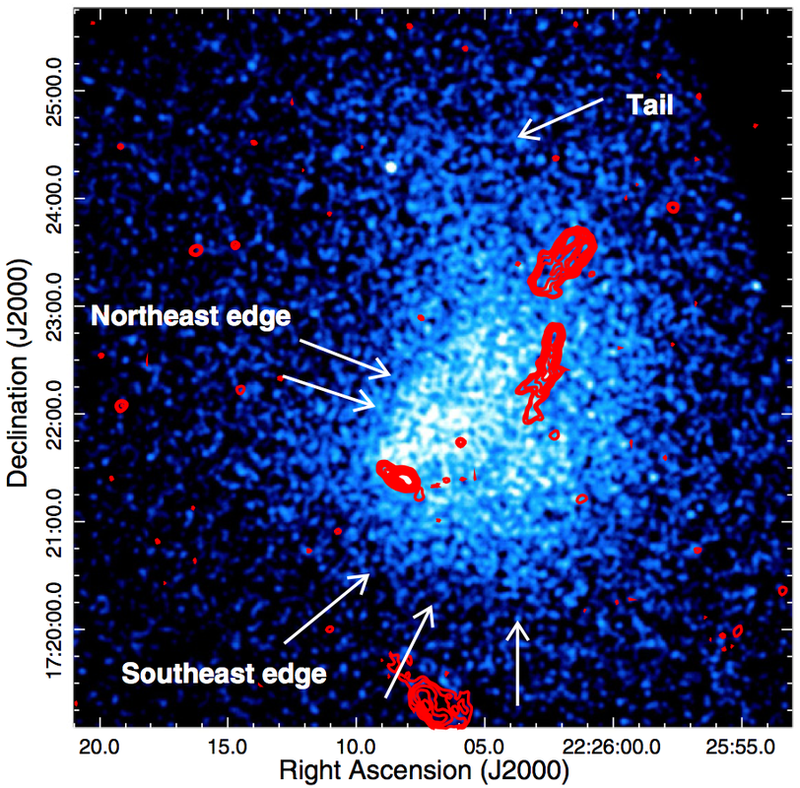 Two head-tail radio galaxies in the northwest show blent tails suggesting motion towards the northwest (consistent with the elongation of the cluster) and possibly suggestive of outgoing subcluster motion post merger. to In addition to 5 head-tail radio galaxies they find evidence for a diffuse radio relic with east-west elongation. 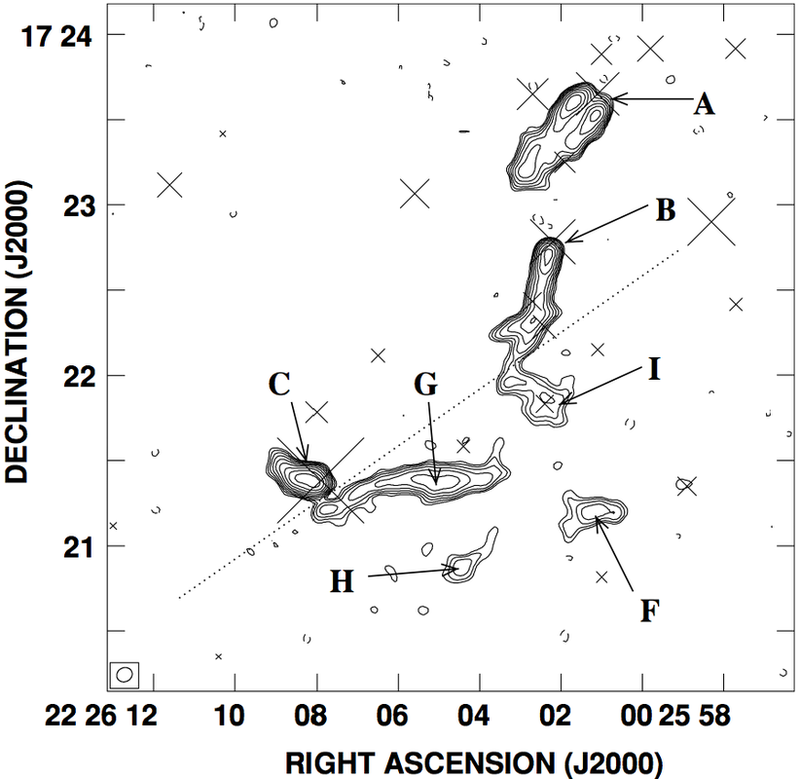 While there are a number of potential point source contaminants in this region, they note that the spectral index of the diffuse emission is too steep to easily be explained by radio galaxy emission and argue that it is much more likely to be a radio relic. Clarke et al. (2013) observed A2443 with 15 ks of Chandra X-ray observations and found evidence that the instra-cluster medium is highly disturbed and elongated along a northwest to southeast axis, that is consistent with the elongated galaxy distribution Wen et al. (2007) observed. They also find two X-ray surface brightness edges, one along the northeast face and one along the southeast face. 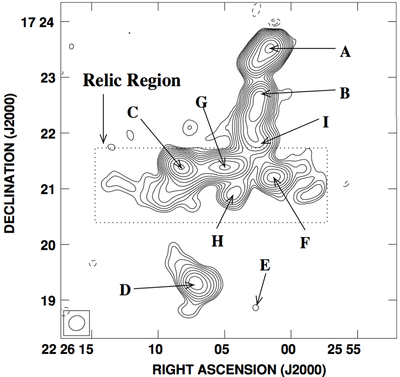 The southeast edge is largely coincident with the radio relic candidate from Cohen & Clarke (2011), suggesting that it may be the result of shocked ICM from a merger. 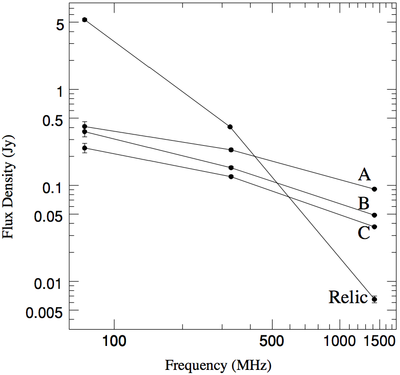 X-ray and radio based on Clark et al. 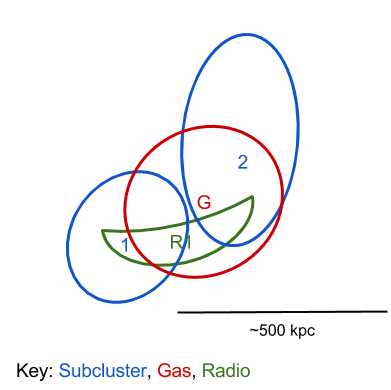 (2013), subclusters based on DEIMOS spectra. Miller, C.J. et al., 2002. 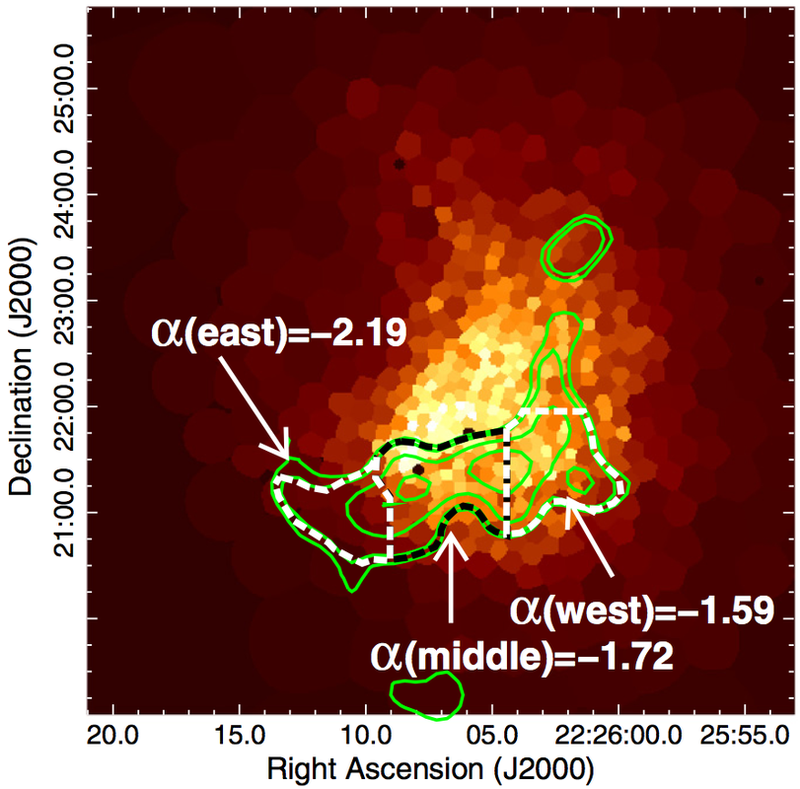 The MX Northern Abell Cluster Survey II: The Abell/ACO Cluster Redshifts and Spatial Analyses. The Astronomical Journal, 124(4), pp.1918–1933. 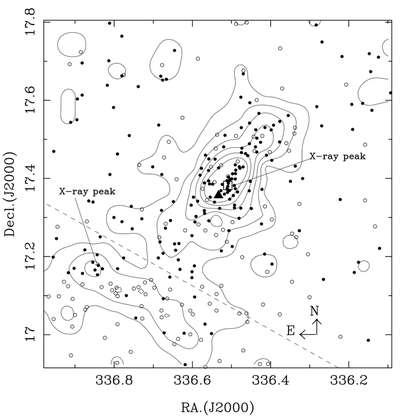 Wen, Z.-L. et al., 2007. 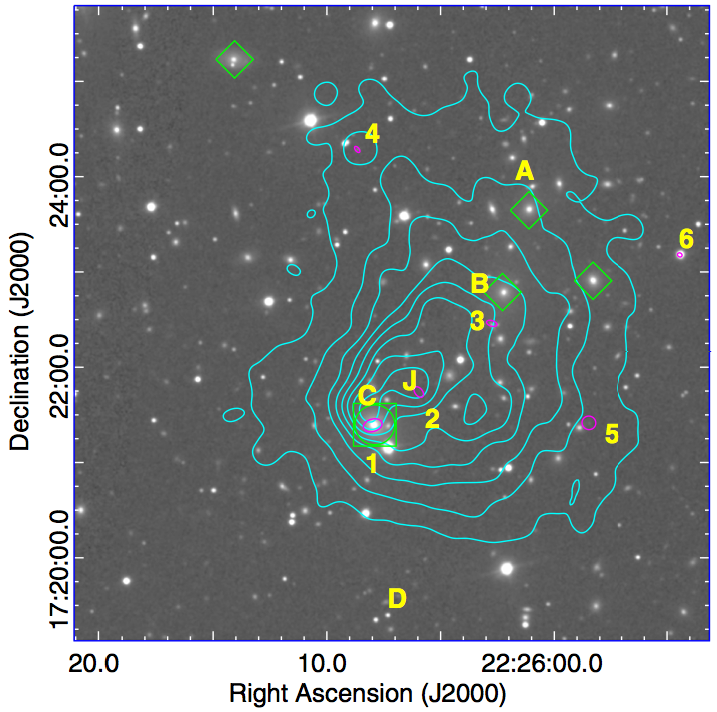 A Fourteen-Band Photometric Study of A2443. Chinese Journal of Astronomy and Astrophysics, 7(1), pp.71–80. Cohen, A.S. & Clarke, T.E., 2011. 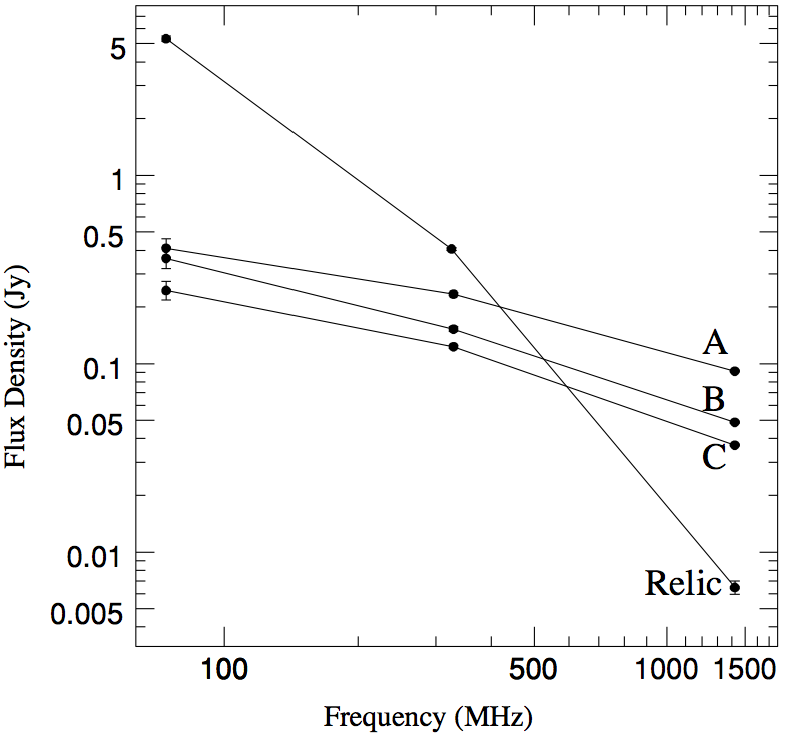 AN ULTRA-STEEP-SPECTRUM RADIO RELIC IN THE GALAXY CLUSTER A2443. The Astronomical Journal, 141(5), p.149. Clarke, T.E. et al., 2013. CHANDRAVIEW OF THE ULTRA-STEEP SPECTRUM RADIO SOURCE IN A2443: MERGER SHOCK-INDUCED COMPRESSION OF FOSSIL RADIO PLASMA? The Astrophysical Journal, 772(2), p.84.